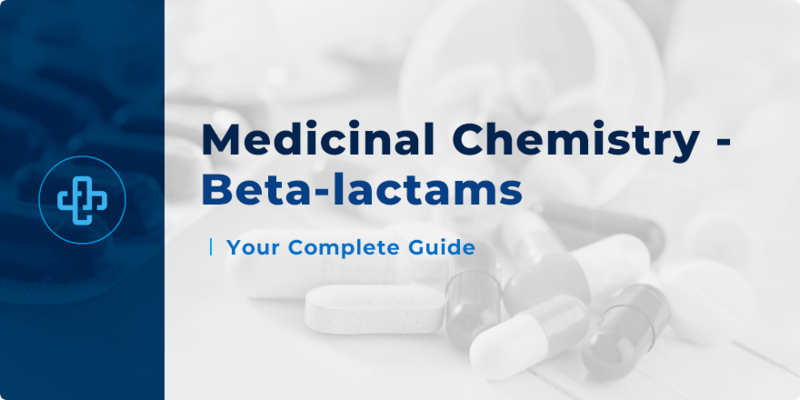 This section focuses on the medicinal chemistry of beta-lactam antibiotics; the second part of our series on the medicinal chemistry of antibacterial compounds. Penicillin derivatives, cephalosporins, monobactams and carbapenems all belong to this popular class of drugs. A four-membered lactam ring, known as a β-lactam ring, is a common structural feature of this class (see below). To this day, the pharmacology of beta-lactam antibiotics has clearly bore out an excellent safety and efficacy profile. Most of these medicines work by interfering with bacterial cell wall synthesis; the cell wall being an optimum drug target because it is something that bacterial cells possess, but not human cells. 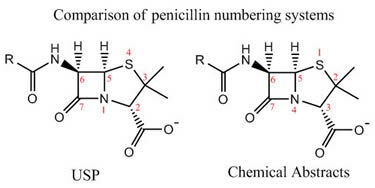 Texts describing penicillins may appear to have conflicting numbering systems; as there are two different, widely used numbering systems. The USP assigns the nitrogen atom at number 1 and the sulfur atom at number 4. In contrast, the Chemical Abstracts system assigns sulfur as number 1 and the nitrogen as number 4. Keep these differing numbering systems in mind when reviewing texts on beta-lactam medicinal chemistry. 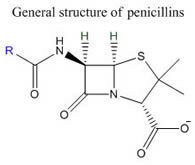 Penicillin’s overall shape is similar to a half-open book. As we talked about earlier, the bicyclic ring system has large, torsional strain and angle strain. Unlike typical tertiary amides, the carbonyl group of the strained four-membered ring is very reactive and susceptible to nucleophilic attack. Think about amide resonance from introductory organic chemistry and its effect on amide reactivity. In the case of the β-lactam ring, amide resonance is diminished. For steric reasons the bonds to the nitrogen cannot be planar; the opening of the four-membered ring relieves strain. Penicillins can react with amines to form inactive amides. This has implications on co-administration and formulation. Activity – Can you draw a reaction mechanism for the scheme shown below? Penicillins are also generally susceptible to hydrolysis under alkaline conditions. Alkaline hydrolysis can be catalysed by the presence of metal ions such as Cu2+.The resulting hydrolysis products do not possess antibacterial activity; this is valuable knowledge for the storage, analysis, and processing of these medicinal chemistry compounds. 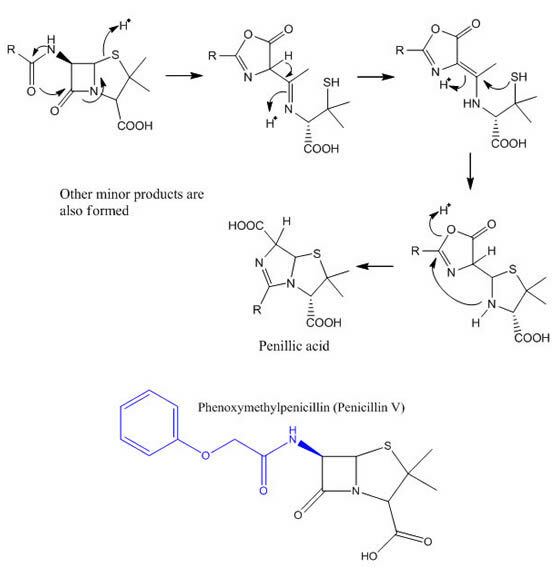 Penicillins also tend to be sensitive to acids (see reaction scheme below). Penillic acid is the major product of acid degradation. In the stomach where conditions are acidic, the drug breaks down. Acidic conditions must also be avoided during production and analysis. Penicillins, such as phenoxymethylpenicillin (Penicillin V), have enhanced acid stability as they have electron withdrawing R groups. 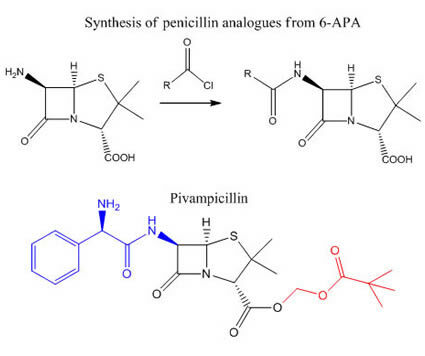 Like many other drugs, penicillins face enzyme-catalysed degradation in vivo. Amidases catalyse the conversion of the C6 amide to an amine. Amidases are useful in industry for the production of 6-Aminopenicillanic acid (6-APA). This compound is used a precursor for many semisynthetic penicillins. Drug resistance is also a growing problem.β-lactamases (beta lactamases) are mainly responsible for this. β-lactamases are serine protease enzymes that act against the β-lactam drugs through a similar mechanism as the transpeptidase enzyme; the bacterial enzyme targeted by penicillin. The mechanism of action will be shown later. β-lactamase inhibitors such as clavulanic acid are given to patients in combination with penicillins such as amoxicillin. The use of clavulanic acid in penicillin formulations allows for a reduction in dosage. Furthermore, the spectrum of activity is also improved. Note that there is no single β-lactamase enzyme. 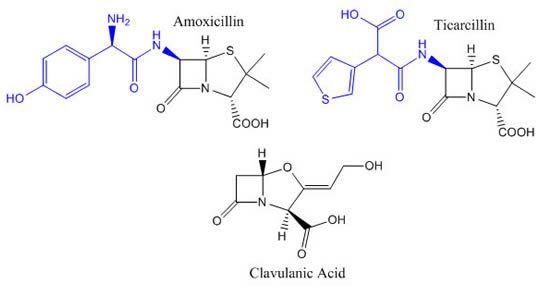 Clavulanic acid does not inhibit all β-lactamase enzymes. Tazobactam and sulbactam are examples of β-lactamase inhibitors that contain the β-lactam ring. Avibactam is an example of a β-lactamase inhibitor that does not have the β-lactam ring in its structure. Now lets turn our attention to the synthesis of semisynthetic derivatives. We briefly mentioned 6-APA earlier. 6-APA is acquired through enzymatic hydrolysis of Penicillin G or Penicillin V, or through traditional organic chemistry. Reaction with an acid chloride at the C6 primary amine allows the synthesis of many semisynthetic penicillin derivatives (try to draw the reaction mechanism as practice!). The free carboxylic acid is, though, a possible site of modification. Ester prodrugs such as pivampicillin were developed to improve the pharmacokinetic properties of their parent drug. Pivampicillin is a pivaloyloxymethyl ester prodrug of ampicillin. We emphasized the cis stereochemistry of the H5-H6 protons at the start of this beta-lactam review. Generally speaking, the H5-H6 coupling constant (1H NMR) is in the range of 4-5 Hz. 13C NMR studies and DEPT experiments would help distinguish between CH, CH2 and CH3. When studying the IR spectra of penicillins, one must be on the lookout for the carbonyl stretches – particularly for the characteristic β-lactam carbonyl stretch at around 1770-1790 cm-1. 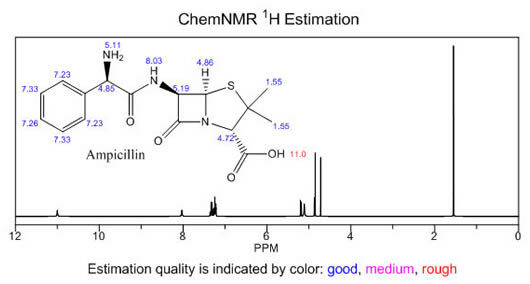 Depending on which penicillin is being studied, the side chain would give characteristic NMR and IR signals.The predicted 1H NMR spectrum of ampicillin is shown below. Note that the spectrum below is merely an estimate. Can you explain why the benzylic protons appear shifted downfield than expected? Recall the structure of bacteria from microbiology. The bacterial cell wall is needed by most bacteria in order to survive. Gram-positive bacteria possess a thick peptidoglycan layer in the cell wall and an inner cell membrane. Gram-negative bacteria, on the other hand, possess an outer membrane and an inner cell membrane. Porins are present in the outer membrane of Gram-negative bacteria. The much thinner peptidoglycan layer of Gram-negative bacteria is found between these two membranes. The significance of this outer membrane in drug design of broad-spectrum penicillins is assessed later. Peptidoglycan (or murein) consists of sugar and amino acid units. This mesh-like polymeric layer outside the inner cell membrane forms the cell wall of bacteria. The sugars N-acetylglucosamine (GlcNAc or NAG) and N-acetylmuramic acid (MurNAc or NAM) alternate, and are connected through a β-(1,4)-glycosidic bond. An amino acid chain is found in each NAM. D-amino acids are also found in these amino acid chains. 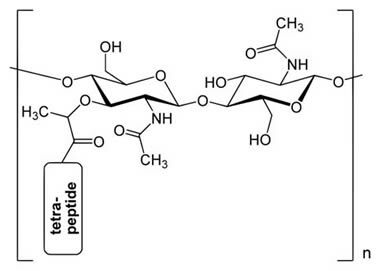 The sugars are cross-linked via these peptides; cross-linking adding structural integrity to the bacterial cell wall. Transpeptidase enzymes are bacterial enzymes responsible for the formation of these crosslinks. Penicillins act by interfering with the cross-linking of peptidoglycan by inhibiting the transpeptidase enzyme. Without an intact cell wall, bacteria are generally unable to survive. Thus, penicillins are bactericidal in effect. Through the synthesis and studies of many semisynthetic penicillins, the following conclusions were reached. We will now consider several other structural modifications. Gram-negative bacteria possess an outer lipopolysaccharide membrane which surrounds the thinner cell wall. The outer membrane serves as a protective layer against compounds that may pose harm to the bacteria. This partly explains why Gram-negative bacteria are generally resistant to antibacterial compounds. As examined earlier, porins are proteins present in the outer membrane. Water and essential nutrients can pass through these proteins. Small drugs can also pass through porins. The ability of drugs to pass through porins is dependent on their size, structure and charge. 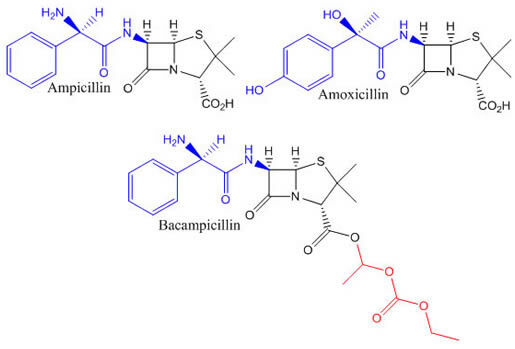 Broad-spectrum antibiotics such as amoxicillin and ampicillin both have -NH2 groups attached to Cα (as shown below); both compounds being orally active. As well as this, the presence of the electron-withdrawing amino group increases acid-stability. Ampicillin is poorly absorbed by the gut due to ionisation of both the amino and carboxylic groups. Oral absorption of amoxicillin is, in contrast, much higher. Modifications, such as changing the carboxylic acid to esters, were made at the carboxylic group to alleviate this problem. Pivampicillin and bacampicillin are examples of ester prodrugs of ampicillin. The prodrugs undergo metabolism in the body to give ampicillin. Can you remember the names of the enzymes involved in the ester hydrolysis of prodrugs? The ureidopenicillins are broad-spectrum penicillins typically used parenterally, and are active against Pseudomonas aeruginosa. As the name suggests, a urea group is present in the molecule. The urea group is situated at Cα. 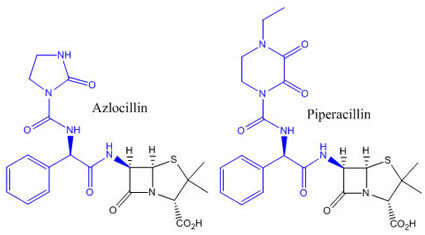 Azlocillin and piperacillin are examples of ureidopenicillins. β-lactamases gave bacteria resistance to the traditional penicillins, driving the need for β-lactamase-resistant penicillins. Steric shields may also be used. This strategy involves designing penicillins to resist β-lactamases. By placing a bulky group on the acylamino side chain, degradation of the drug by β-lactamases is minimized. However, if a steric shield is too bulky, the penicillin is not able to bind to transpeptidase. Methicillin is an example of a penicillin with a bulky group. This semi-synthetic penicillin possesses a dimethoxybenzene R group. Both the methoxy groups of the benzene are at the ortho position. Nafcillin possesses a naphthalene ring in its acylamino side chain which acts as a steric shield. 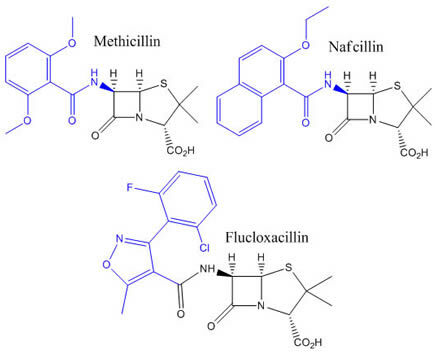 Flucloxacillin contains a bulky and electron-withdrawing heterocyclic acylamino side chain. Thus, flucloxacillin is an acid-resistant, narrow-spectrum, β-lactamase-resistant penicillin. Cephalosporin C was the first cephalosporin discovered from a fungus obtained from Sardinian sewer waters during the mid-1940s. Just like penicillins, Cephalosporin C has a bicyclic system made up of a β-lactam ring fused with a sulfur heterocycle, which, in this case, is the dihydrothiazine ring.The side chain is referred to as the aminoadipic side chain. 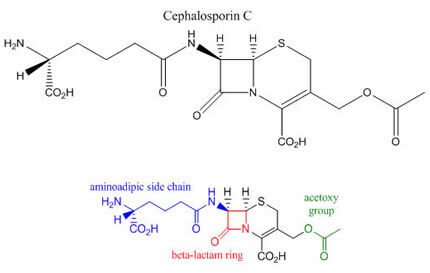 The acetoxy group of Cephalosporin C is a key feature; a feature examined in more detail later. Cephalosporin C is less potent compared to penicillins, but this compound has many advantageous properties. Cephalosporin C is more acid-resistant and has a better spectrum of activity, for example. Moreover, the likelihood of causing allergic reactions is considerably less. As a result, cephalosporin C became a useful lead compound for the development of better, more clinically robust antibiotics. Compared to the penicillins, the ring system strain is not as great, but, like the β-lactam carbonyl of penicillins, the β-lactam carbonyl group of Cephalosporin C is also reactive for similar reasons. Diminished amide resonance and ring strain confers reactivity. The four-membered ring is also susceptible to nucleophilic attack. Cephalosporin C inhibits the transpeptidase enzyme through the mechanism shown below. A serine residue is involved. As shown below, the acetoxy group serves as a leaving group. 7-aminocephalosporinic acid (7-ACA) is used as the precursor of many cephalosporins. Unlike 6-APA which can be acquired from enzymatic hydrolysis of certain penicillins, 7-ACA cannot be acquired by enzymatic hydrolysis of Cephalosporin C. 7-ACA is produced by chemical hydrolysis of Cephalosporin C. Due to the presence of the reactive β-lactam ring, a special method of chemical hydrolysis was devised. Can you draw a mechanism for the formation of the imino chloride? Cephalosporin analogues may be formed by reacting 7-ACA with acid chlorides. Other groups may be substituted for the acetoxy group which may or may not serve as good leaving groups. The nature of the leaving group is important for activity. Better leaving groups tend to give cephalosporin C analogues with better activity. Sites of possible modifications are highlighted in red boxes. 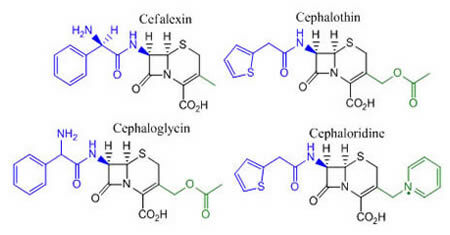 Cefalexin, cephalothin (cefalotin), cephaloglycin, and cephaloridine are examples of first-generation cephalosporins. The methyl group in cephalexin is a poor leaving group, which is bad for activity. However, the use of a methyl group appears to improve absorption. 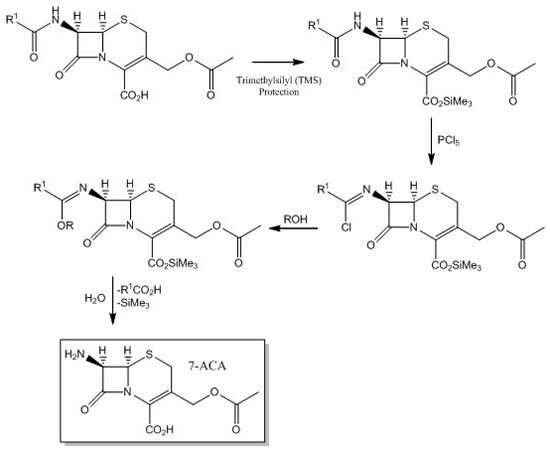 Cefalexin may be synthesized through an acid-catalysed ring expansion of a penicillin. Cephalothin has an acetoxy as a leaving group and a 1-(thiophen-2-yl)propan-2-one in its acylamino side chain. Despite being a good leaving group, the acetoxy moiety is susceptible to enzyme-catalysed hydrolysis. Cephaloglycin’s acylamino side chain is the same as that for ampicillin. Cephaloridine has pyridinium as a leaving group, giving pyridine. Unlike the acetoxy group, the pyridinium is stable to metabolism. 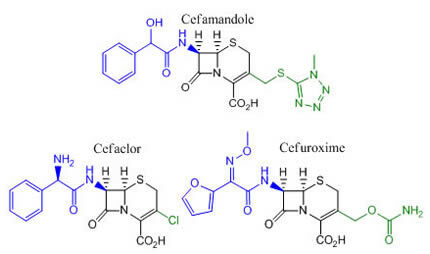 Cefamandole, cefaclor, and cefuroxime are examples of second-generation cephalosporins. The second-generation have increased activity against Gram-negative species of bacteria such as Neisseria gonorrhoeæ, while some have decreased Gram-positive activity. Many cephalosporins that fall under the second-generation group are also able to cross the blood-brain barrier. Cefuroxime is also an example of an oximinocephalosporin. The presence of the iminomethoxy group appears to increase stability against certain β-lactamases. Cefdinir and ceftriaxone belong to the third-generation of cephalosporins. During 2008, cefdinir was one of the highest-selling cephalosporins. Ceftriaxone is marketed by Hoffmann-La Roche under the trade name Rocephin® (known for its painful administration). Overall, third-generation cephalosporins are more stable to β-lactamase degradation, and have even greater anti-Gram-negative activity. Like the previous generation, the third-generation are able to cross the blood brain barrier, making them useful against meningococci. The fourth-generation compounds exist are zwitterionic. The fourth-generation cephalosporins are not only better at traversing the outer membrane of Gram-negative bacteria, but these compounds also have similar activity against Gram-positive bacteria as first-generation cephalosporins. Moreover, β-lactamase resistance is also greater. Like the 2nd and 3rd generations, many of the 4th generation can cross the blood brain barrier. They are also used against Pseudomonas aeruginosa. Currently, members of the scientific community have not reached agreement with regards to the use of the term ‘fifth-generation cephalosporins’. Fifth-generation compounds have demonstrable activity against MRSA. Ceftobiprole is often described as a fifth-generation cephalosporin. This compound possesses good anti-Pseudomonal activity. Ceftaroline fosamil is also another example of a cephalosporin described as fifth-generation. Recall that one of the hydrogens emphasised earlier is a possible site of modification. The methoxy substituted versions are referred to cephamycins. A compound called cephamycin C can be isolated from Streptomyces clavuligerus. A urethane group is present instead of the acetoxy group, enhancing the compounds metabolic stability. Can you explain why? Derivatives may be synthesised from the methoxy-substituted analogue of 7-ACA, or through reactions with cephalosporins. Note that some refer to cephamycins as a separate class of antibacterial compounds altogether. The cephamycins appear to have greater resistance against β-lactamases. Cephalosporins and cephamycins are sometimes collectively referred to as cephems. Fused β-lactam and dihydrothiazine ring form a bicyclic system. 1st: Activity is comparably lower than penicillins but possess a broader spectrum of activity. Greater activity for Gram-positive organisms than Gram-negative organisms. 2nd: Have increased activity against Gram-negative bacteria but some have a concomitant reduction of Gram-positive activity. Many can cross the blood-brain barrier. 3rd: Even better activity against Gram-negative bacteria. Some compounds have the same problem of decreased Gram-positive activity as with the previous generation. They are also associated with improved β-lactamase resistance and many can also cross the blood-brain barrier. 4th: Better Gram-negative bacteria activity, β-lactamase resistance, and many can also cross the blood-brain barrier. Gram-positive activity similar to the 1st generation. 5th: Currently no universal agreement on its definition. Some drugs classified as ‘fourth-generation’ are classified as ‘fifth-generation’ and vice versa. Examples often include ceftobiprole, ceftaroline and ceftolozane. Ceftobiprole has potent anti-Pseudomonal activity and confers little resistance. Fifth-generation drugs also show activity against MRSA. 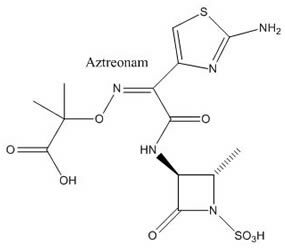 As the name suggests, the monobactams, such as aztreonam ,are β-lactam compounds that are not fused to another ring. Monobactams exhibit moderate activity against certain Gram-negative bacteria in vitro, including Neisseria and Pseudomonas. The carbapenem class of β-Lactam antibiotics have broad-spectrum activity and exhibit resistance to many β-lactamases. Carbapenems are used as antibiotics of last resort for infections of bacteria such as Escherichia coli and Klebsiella pneumoniae. Thienemycin is a carbapenem first discovered and isolated from Streptomyces cattleya in 1976. Thienamycin exhibits excellent activity against Gram-positive and Gram-negative bacteria and displays resistance to many β-lactamases. Meropenem and doripenem are analogues of thienemycin and are examples of carbapenems currently in clinical use. Both compounds have been described as ultra-broad-spectrum. From the structure of the compounds shown, it is easy to see that the carbapenems have some structural features that penicillins do not. The double-bond on the five-membered ring leads to high ring strain. A sulfur atom is also missing in the five-membered ring. The acylamino side chain is absent. Also note the trans stereochemistry of the hydrogens. This concludes our review of the medicinal chemistry of beta-lactam antibiotics; a subject often featured on pharmacy, pharmaceutical chemistry and other medicinal-related courses. It informs the reader of structure-activity relationships, the development of synthetic derivatives, and how medicinal chemistry relates to broader concepts such as formulation and dosage. The growing problem of resistance is an ever-present challenge for medicinal chemists; a biological mechanism that spurs on the engine of research in this field.